Secretary of National Security and Defence Council, Oleksandr Turchynov, blamed the chief of the General Staff of the Armed Forces, Viktor Muzhenko, for the explosions in the territory of military ammunition depot in Kalynivka, Vinnytsya Region. Speaking to a briefing on 28 September, Turchynov said that a huge amount of military ammunition was lost during in the destruction of arsenals in Balakliya (Kharkiv Region) in March, and in Kalynivka. "The country's defence capability suffered a huge blow. I believe, and I raised this issue during a meeting of the Defence Cabinet, that the entire line of command of those responsible for the nation's defence, from the chief of Genral Staff down, should answer for that," said Turchynov. "We have demonstrated that we are incapable of protecting our strategic arsenals which raises doubts about the quality of our country's defence. As long as our top officials who do not duly perform their functions, we will keep the tally of our losses and damages," Turchynov said. He said that violations of fire safety were detected at the territory of the arsenal. "These are the issues that should have been in due time resolved in accordance with the decisions of the National Security Council, the Cabinet, the Ministry of Defence, since the fire near Svatovo, Luhansk Region. Resolutions have been taken, instructions have been given, but, unfortunately, most of them have never been been implemented, and so we have these consequences," Turchynov said. LB. 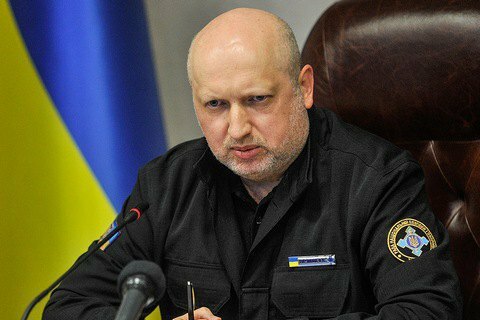 ua has learned from its sources that Turchynov in the course of yesterday's meeting of the Defence Cabinet directly demanded the resignation of Viktor Muzhenko. The military prosecutor's office said it was investigating the explosions in Kalynivka as an act of sabotage. On Thursday, Ukraine's Chief Military Prosecutor Anatoliy Matios denied information about subversive groups in Kalynivka. In March, a fire on the territory of Ukraine's largest military warehouse in Balakliya, Kharkiv region, caused the massive detonation of 125- and 152-mm tank and artillery shells. The military prosecutor's office at that time said the fire was caused by an act of sabotage with the use of a drone. President orders to beef up defence, protect strategic facilities.